Also attach the Hi/Lo files of your image for programming. Sorry I'm not sure I understand your post - does this mean the previous image is working? Or do you still need me to do the debug thing? No everything OK and working! Predator99 wrote: No everything OK and working! First a big thanks to MMaximus to send me this very nice (but not working) Suntac board!!! Bios is the Phoenix 3.10.22 as posted above. Everything seems to be OK, except the Monitor...! Had no success in removing all socketed ICs or playing with the Jumpers. Also tried other RAMs. This indicates an error accessing/adressing the Video memory? Tried several VGAs, same result. To my surprise, the board is up after finishing the POST. I can switch the keyboard LEDs and a reboot with Ctrl-Alt-Del works. No idea at the moment, no damage visible except some minor battery corrosion. 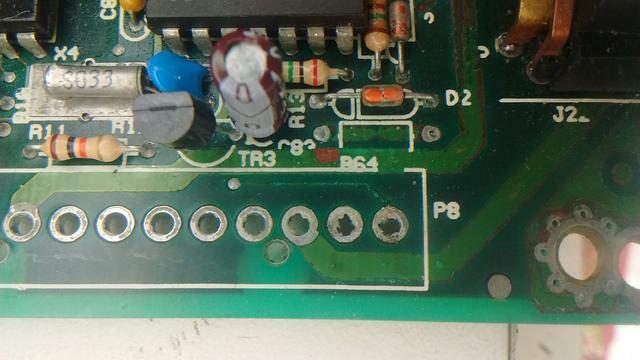 All LEDs on the POST card are OK.
That poor thing… look at the corrosion on the ISA slots! Predator99 wrote: This indicates an error accessing/adressing the Video memory? Tried several VGAs, same result. To my surprise, the board is up after finishing the POST. I can switch the keyboard LEDs and a reboot with Ctrl-Alt-Del works. My guess would be a problem with one of the address lines on the ISA bus. The way these mobos are wired it's very unlikely to be a low byte data line issue since that would upset the big chips with DMA controllers and whatnot. And the lower address bits seem to work OK-ish for the same reason but it could be a line being stuck for example. Now, the exact pin on '004 doesn't matter as long as there is a connection somewhere. Take your time with it, you don't want to miss any of these tests. Also, inspect all of the slots and make sure there isn't a bent contact anywhere that would short the ISA A and B sides - that can be verified with the meter as well but a good look should suffice. I tested again a CGA and VGA in different slots - same results. So I tested all Pins in the 8-bit ISA Slot 1 against Slot 8 - all connected. EDIT: OK, tracked the adress lines as far as possible. Some end in the ST62BC002 the remaining in the St62BC003. From a optical point of view all perfect, but will verify. Predator99 wrote: But there is no conection of all adress lines to the ST62BC004. Addresses A1-A12 go to 003 chip, and A13-A19 to 002. I haven't yet found which chip decodes A0. For now though check the A13-A19 lines first, and then move to /MEMR (B12) and /MEMW (B11) which should be connected to 001, most likely through 30 ohm resistors. Let's get this out of the way first. What also might be inteersting: The status of the LEDs on the Post-card: All lights on, except the IRDY, which is blinking during POST sequence and turns off at the end. Therefore the Reset-LED is "on" all the time. Think this should not be correct. Even more strange that the board powers up in this status. Predator99 wrote: What also might be inteersting: The status of the LEDs on the Post-card: All lights on, except the IRDY, which is blinking during POST sequence and turns off at the end. Oh, a clue! Do you have a reset switch connected? Try without it. And measure voltage across the pins you'd connect it to, it should be +5V. Whatever the result, also measure pins 5 and 6 of the 4069 chip, and then 5 and 6 of the 7406. Both are next to 8042 keyboard controller chip. That reset problem sounds kind of familiar to me . Remember that there is a hidden conection under the power connector, mine was corroed and it was causing the reset state problems. Is taht tiny almos invisible corred line (connector removed). The trace under the power-connector is OK. Measured on the bottom side. Next one: "Youth Keep Enterprise Co., Ltd." 301-02. Was totally dirty. Removed all ICs and did a complete shower. But still working. Somehow I missed your first reply. Anyway, the values look good so I wonder what is up with the LED. Just to make sure I did not misunderstand, the test card RESET LED is on at all times and even when the reset switch is connected and used it doesn't change the LED state? - Check if there is continuity between reset switch header (the pin that is not ground) and pin 42 of the 001 chip. This is mostly a sanity test but take a note of the resistance value, should be below 1 ohm or low ohms at worst. - Check resistance between 001 pin 17 and +5V, you should be getting very close to 1k. Check the voltage on this pin when the systems runs, and when reset switch is pressed (you might need extra pair of hands for this). - Check if there is continuity between 001 pin 17 and ISA slot pin B2. The 001 chip is a bit weird in that the pin count starts in the middle, next to the dot, and then goes CCW. There are silkscreen numbers in the corners that should help you. EDIT: Oh and I dunk dirty PCBs in water (with some dishwashing liquid) all the time, haven't had a problem yet - the important part is to make sure they dry out before reapplying power. Scrubbing them while wet with a nylon brush is also not a problem unless you get a PCB in such a sorry state that the soldermask is peeling off on it's own. Just to make sure I did not misunderstand, the test card RESET LED is on at all times and even when the reset switch is connected and used it doesn't change the LED state? Correct. Its on all the time. Also not blinking when pressing reset. However, when pressing reset POST sequence starts from beginning. - Check resistance between 001 pin 17 and +5V, you should be getting very close to 1k. Check the voltage on this pin when the systems runs, and when reset switch is pressed (you might need extra pair of hands for this). Everything is OK then except this: No continuity between 001 pin 17 and ISA slot pin B2. Well that'a your problem right there. This might be interpreted by the video card as reset being asserted all the time so it's just not working. This is sort of a global reset signal, generated by the 001 chip, it goes to other mainboard chips and should also go to ISA slots pin B2. You've already checked all the ISA slots against each other and found no broken connections (though you might want to retest B2 again now) so I wonder what happened to this signal. I suppose the only option is to try and track the copper trace. The 1k pull-up on this signal is provided by "RA5" which should be a resistor pack below the 006 chip. Try to find which pin is it and solder a wire from there to one of the B2 pins (be extra careful not to mix the ISA slot sides!). Try booting with VGA card again. The point is it's still preferable to find the broken connection but first I'd like to check if that solves the actual problem or not. Deunan you are the master!!! I noticed on the working board that the ISA reset pin is directly connected to pin 92 of the 006. And this connection was missing on the damaged board. But no chance to track the trace, the starting end ending points are hidden here. As I have no soldering iron available here I made a quick&dirty fix with a wire and a needle. Power up..Reset LED is off...and works!!!! Many thanks to you, learned a lot again. And also many thanks to MMaximus for this board! Predator99 wrote: Deunan you are the master!!! That's amazing! Deunan, your expertise is legendary I've been following this thread and the other Kenitec Suntac thread and am really impressed that you managed to essentially tele-repair these boards. Predator99, I'm really happy that this boards finally works! Maybe I need to send you my other Suntac boards as well so you can fix them. I would do it myself, unfortunately I have literally no idea what you guys are talking about most of the time. I really want to learn at some stage as I have a good dozen of motherboards that won't start, but I'm such a newbie with electronics that I wouldn't know where to begin.